Carcinoma of the choroid plexus is an uncommon intracranial neoplasm with a particularly virulent course. Around 80% of choroid plexus carcinoma (CPC) arise in children, in whom they constitute 15-20% of choroid plexus tumors. Due to their rarity, reports on CPC most often focus on single cases or single-institution experiences with a limited number of patients. Recently, we also encountered a case of left lateral ventricle CPC in a young child who was operated in poor neurological grade. A 6-year-old male child presented to us with history of gradually progressive holocranial headache for 4 months and mild weakness right side of the body for 3 months. At the time of admission patient was conscious, with Glasgow coma score (GCS) E4V5M6, pupils were bilateral normal size and reactive, bilateral papilledema was present. Right-side hemiparesis (power: MRC grade 4/5) with right upper motor neuron facial paresis was present. Rest of the neurological examination was within normal limits. 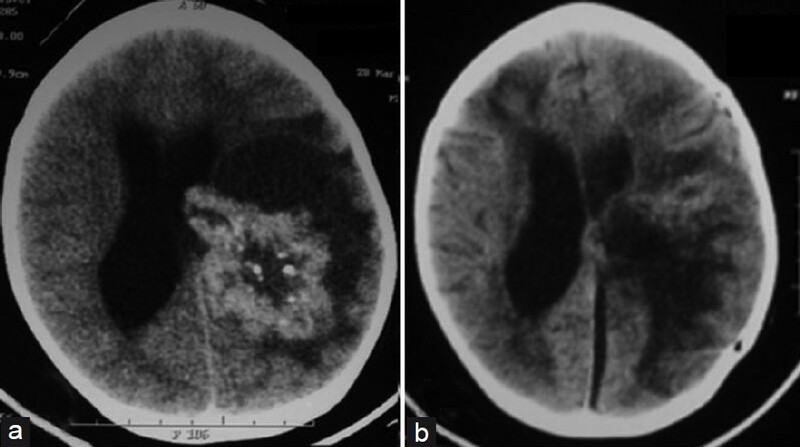 Computed tomography (CT) brain was showing a large irregular hyperdense lesion with calcification and perilesional edema in left parietal region with infiltration of left lateral ventricle with hydrocephalus [Figure 1]a. Magnetic resonance imaging (MRI) brain was showing a large ill-defined tumor in left parietal region, hypointense on T1 and hyperintense on T2-weighted image and strong heterogeneous enhancement with gadolinium. The lesion was infiltrating left lateral ventricle and left thalamic region with dilatation of opposite lateral ventricle with midline shift and perilesional edema [Figure 2]. 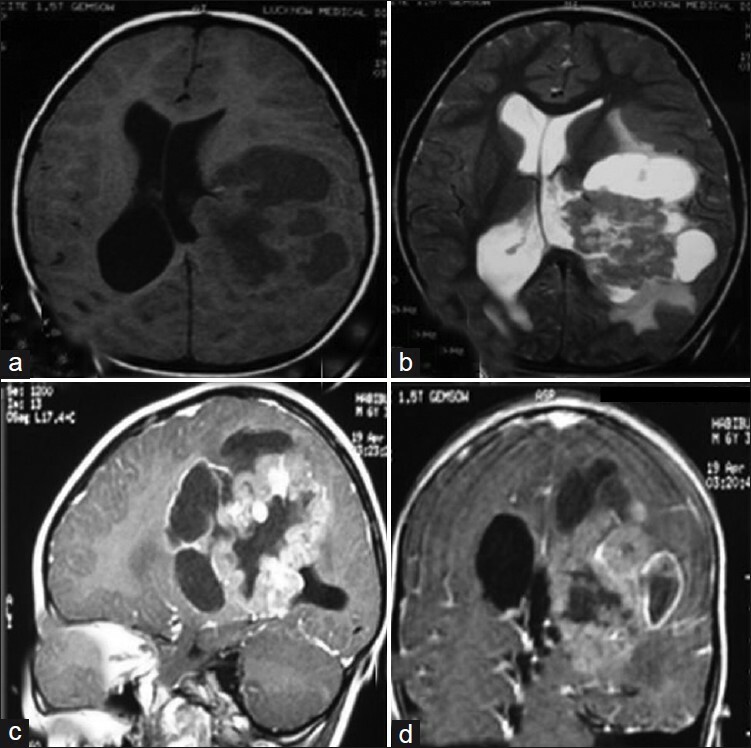 Based on radiology, a differential diagnosis of ependymoma, primitive neuroectodermal tumor, and high-grade glioma was kept. Preoperatively child deteriorated following an episode of seizure to GCS E1V1M3. His pupil became bilateral semidilated and sluggish reactive. Immediate ventricular tapping was done. Ventricular pressure was raised. External ventricular drain was put and patient was taken for emergency surgery. A left parieto-occipital craniotomy was made and gross total excision of the tumor was done. Intraoperatively, brain was tense at dural opening. Tumor was reaching up to the cortical surface. Tumor was soft, moderately vascular, and partly suckable with a gritty consistency at places. Tumor appeared to arise from choroid plexus of lateral ventricle. Postoperative period was uneventful. 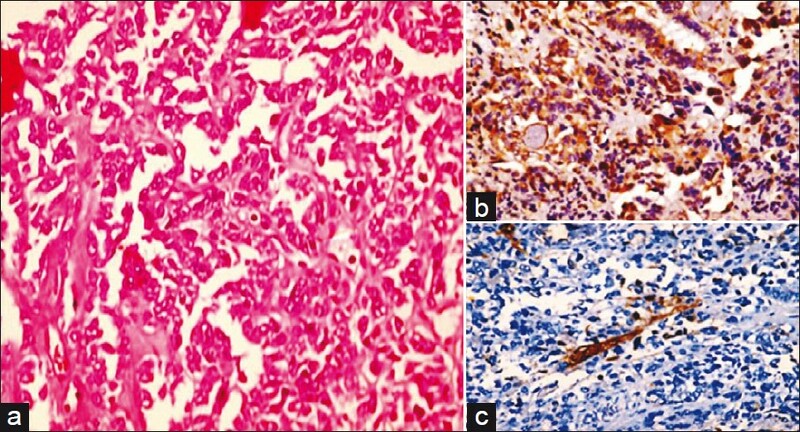 Histopathology and immunohistochemistry were consistent with diagnosis of CPC [Figure 3]. Postoperative CT scan showed gross total excision of tumor [Figure 1]b. Patient gradually improved to GCS E4V2M5 and transferred to radiotherapy department. Patient died 15 days after completing radiotherapy due to nonsurgical cause. Most of the time, we do not suspect this entity preoperatively and the diagnosis is established after histopathology report. Sometimes, the distinction between choroid plexus papilloma and CPC is not obvious even with histopathology and in these cases immunohistochemistry becomes important in establishing the diagnosis, as happened in our case. Choroid plexus papillomas have histologic features that are very similar to those of the normal choroid plexus. The histologic criteria for malignant tumors of the choroid plexus, that is, CPCs were first developed by Lewis in the 1960s, refined by Russell and Rubinstein two decades later, and most recently modified by the WHO. The established criteria are as follows: (1) obvious invasion of adjacent neural tissue with the infiltrating cells on a stromal base; (2) loss of regular papillary architecture; and (3) evidence of increased mitotic activity, nuclear atypia, and necrosis. , CPCs typically stain positive for cytokeratins and display variable expression of vimentin, S100, transthyretin, and glial fibrillary acidic protein (GFAP). Positivity for S100 and transthyretin is typically less than that seen in CPP. CPCs stain positive for GFAP in approximately 20% of tumors. , In our case, immunohistochemical staining was positive for GFAP and cytokeratin. In our case, patient died 3 months after operation despite gross total excision of tumor and adjuvant radiotherapy, as the long-term survival not only depends on complete excision but also on preoperative neurological status. Our patient was operated in low GCS, i.e., E1V1M3, although he gradually improved to GCS E4V2M5 but expired due to nonsurgical cause, probably aspiration pneumonitis. 1. WHO classification of tumors of central nervous system. 4 th ed. WHO; 2007. p. 82-6. 2. Bleggi-Torres LF, Urban LA, Antoniuk A, Carboni P, Ramina R, Gugelmin ES. Choroid plexus carcinoma: Report of 15cases. Arq Neuropsiquiatr 2000;58:505-11. 3. Menon G, Nair SN, Baldewa SS, Rao RB, Krishnakumar KP, Gopalakrishnan CV. Choroid plexus tumors: An institutional series of 25 patients. Neurol India 2010;58:429-35. 4. Wrede B, Liu P, Wolff JE. Chemotherapy improves the survival of patients with choroid plexus carcinoma: A meta-analysis of individual cases with choroid plexus tumors. J Neurooncol 2007;85:345-51. 5. Singh A, Yermani S, Shruti S. Choroid plexus carcinoma: Report of two cases. Indian J Pathol Microbiol 2009;52:405-7. 6. Gopal P, Parker JR, Debski R, Parker JC Jr. Choroid plexus carcinoma. Arch Pathol Lab Med 2008;132:1350-4. 7. Collias JC. Choroid plexus carcinoma. J Neurosurg 1975;43:225-32. 8. Berger C, Thiesse P, Lellouch-Tubiana A, Kalifa C, Pierre-Kahn A, Bouffet E. Choroid plexus carcinomas in childhood: Clinical features and prognostic factors. Neurosurgery 1998;42:470-5. 9. Packer RJ, Perilongo G, Johnson D, Sutton LN, Vezina G, Zimmermann RA, et al. Choroid plexus carcinoma of childhood. Cancer 1992; 69:580-5.